​​By chapter 8 of Luke's gospel Jesus' ministry is in full swing. God incarnate is making physical contact with his creation. He loves us and he is proving it with every word and every action. Two distinctly different individuals bow before Jesus in the story of Jarius' daughter. Jesus shows concern, care, and love for both. He doesn't distinguish between the powerful status of Jarius or the powerless position of the woman with the issue of blood. While both individuals exhibited a form of faith by just seeking Jesus, Jesus also seems to defy any hint of a formula for his healing. I think Jesus' specificity with each individual is another wonderful characteristic of the kingdom of God. When Jesus raised Jarius's daughter from the dead he took her by the hand and spoke to her. I'm thankful Jesus isn't afraid to touch the dead or address those shunned or ignored by others. When speaking to the woman who found healing with the touch of his robe he called her daughter. This may have allowed Jarius to identify with this woman because of his own reasons for seeking Jesus. Jarius may have even found encouragement through her healing. Jesus bid the women to go in peace telling her that her faith had healed her and I think it's reasonable to imagine him helping her up off the ground after bowing before him. 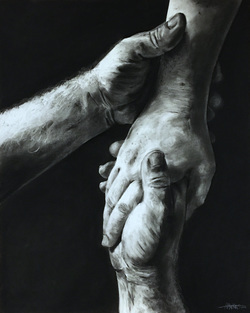 This drawing represents both miracles of healing exhibited in the story and the willingness of Jesus to interact with us at a personal level. Jesus immensely cares for each and everyone of us. Even greater than physical healing, we will soon read about his ultimate demonstration of investment and love in our lives. God's love is extravagant.